It's finally finished ! well almost, there's still some furniture and fittings to make. 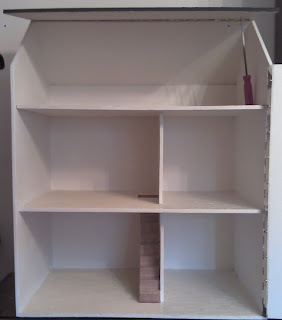 This year we decided our daughter should have a dolls house, and after looking about at the various ones available and not really thinking any of them appropriate, I decided I'd make one, famous last words. To be fair I could have had it finished months ago, but as usual I left it until the last minute, it's all but finished now, with the help of my most excellent wife all that needs doing is some extra fittings and furniture, but we intend it to be something that evolves and grows with our daughter, and hopefully in time she will feel like making her own things for it as well. I built a house ! 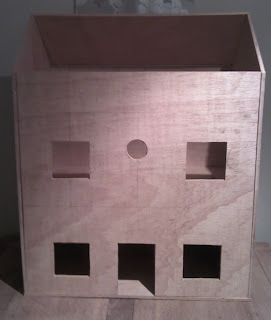 It's quite big as these things go, it's about 2 feet wide, 2 feet tall and a foot and a half deep, it has 3 floors and the entire front opens up for easy access, half of the roof also opens up, even the front door opens, but I've yet to make the shutters for the windows, or the window boxes. 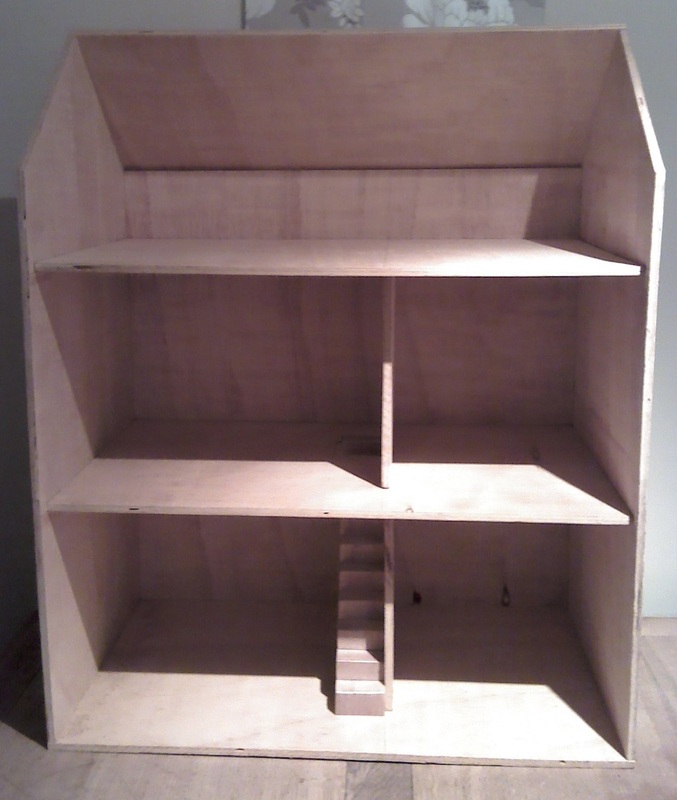 It's made from a combination of different thicknesses of plywood, so it's pretty study, and in theory should take a good playing with, unlike some of the ones we looked at online and in toy shops. The 3 floors and stairs. The whole house is made from a single sheet of plywood, the stairs in the picture are made from 4mm plywood, and built more or less like a real set of stairs, things like banisters will get added at a later stage if my daughter decides she wants them. 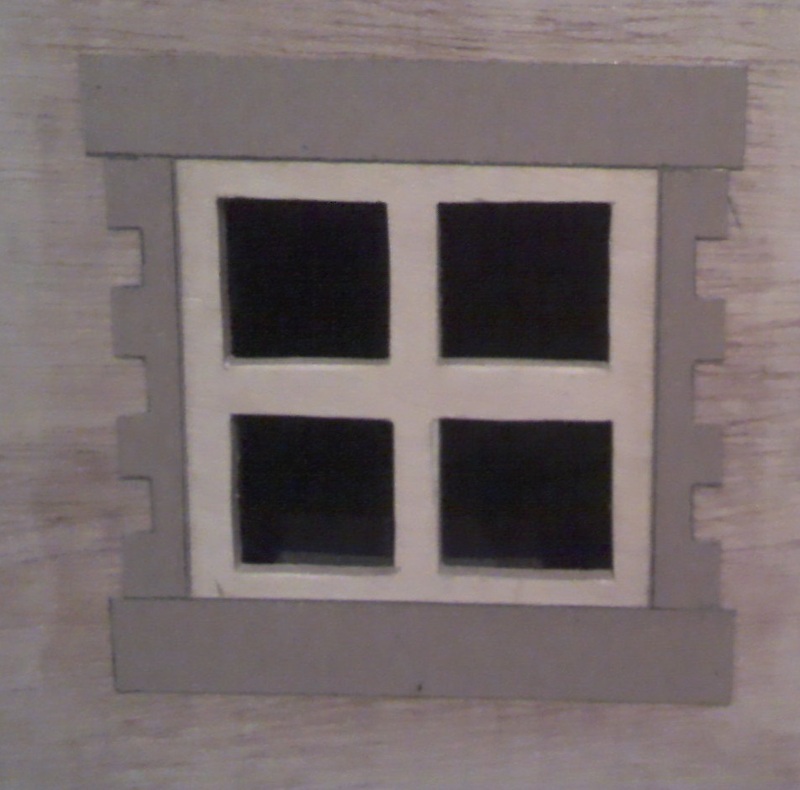 I made the roof tiles, for both sides of the roof. The mock stone work is also done in card. I decided to do the stone window and door surrounds in card as well, I was going to use thin plywood, but after cutting some out it didn't look right, the window frames are made from 6mm plywood and inserted into the holes I made in the front. We had to get creative when it came to decoration, we chose a plain cream colour for the internal walls, and the flooring is wallpaper, we used 2 different sorts, one of which looks a little like flag stones, and the other looks quite like the natural sea grass type carpets you can get. We used this in the kitchen and bathroom. This one is in the living room and bedroom, and the attic. Once the flooring was in we coated it all in pva to make it a little harder wearing, it also means we can give things a wipe over if needed, we also coated the roof in pva after it was painted, and the paint for the walls inside and out had pva mixed in with it, adding pva to emulsion seems to make it a little more durable, and it can be wiped over with a cloth, with out taking the paint off. All done, you can see the roof lid as well. For the front of the house we used plain white emulsion (with a bit of pva) and pink lacquer paint (Japlac) the white was for the walls and I used the pink to pick out the mock stone work around the windows, I also painted the front door in pink as well, but figured the door would stand out more if I painted the surround in a darker colour, so I used the same paint as I used on the roof, then we just added a handle so that the front can be easily opened and closed. Of course every house needs furniture, amongst other things, so we've also been making furniture for the various rooms, this is another thing we hope will evolve as the years go by. The furniture is simply made, but quite sturdy, and as our daughter gets older she can add different stuff, no doubt she'll be pestering me to make new stuff. 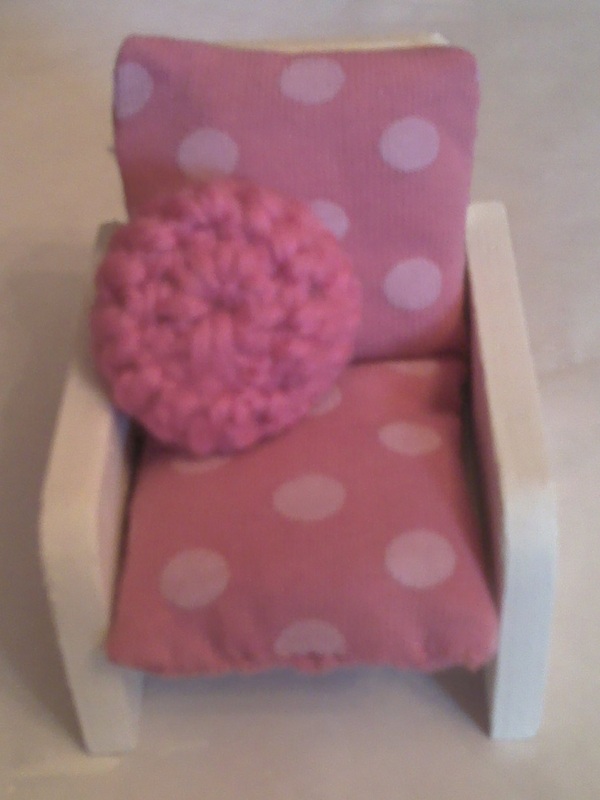 Easy to make, just needs cushions. My wife has been making the cushions for the chairs and the mattresses for the beds, she even crocheted some small scatter cushions for each chair, it was my wife's idea to also use some small picture frames we had lying about to make some artwork for each room, and I have to say it was also my wife that suggested making a flat screen tv out of an old mp3 player case I had lying about, as you might guess my wife is in charge of interior decor, and it wouldn't be Christmas with out a Christmas tree, so my wife made one. I think they look brilliant. We used pictures our daughter likes for the tv and wall hanging. Complete with Hello Kitty artwork. We also have a small bench for the attic, or play room as it's now called, my wife added the heart decoration, and plans to do a similar thing to the beds. And for the front door my wife also made an excellent wreath, wouldn't be Christmas with out one. And that's about as far as we've got, this will make up part of our daughters Christmas presents, hopefully she'll forgive me for saying it was a tool box ;-) not sure I fooled her with that anyway. 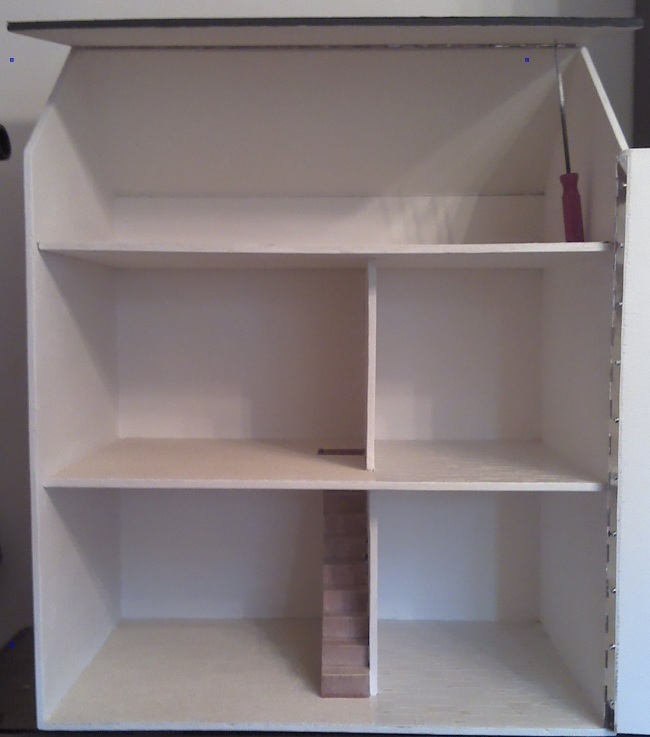 We have many more plans for things to make for it, including a roll top bath and a toilet, I have a load of miniature kitchen units to make as well, and I'll probably be making stuff for it for years to come. I could have just gone out and bought one, but I personally think if you can make something like this (and mine isn't perfect) then you should give it a go, this actually worked out cheaper than a bought one of a similar size, and it'll last longer as well, but besides that it's a handmade gift for my daughter, and I know even at 3 she'll appreciate this more because mum and dad made it for her, than she would one from a shop. This will most likely be my last post this year, so thanks for reading and we wish you all a happy Christmas and all the best for the new year. 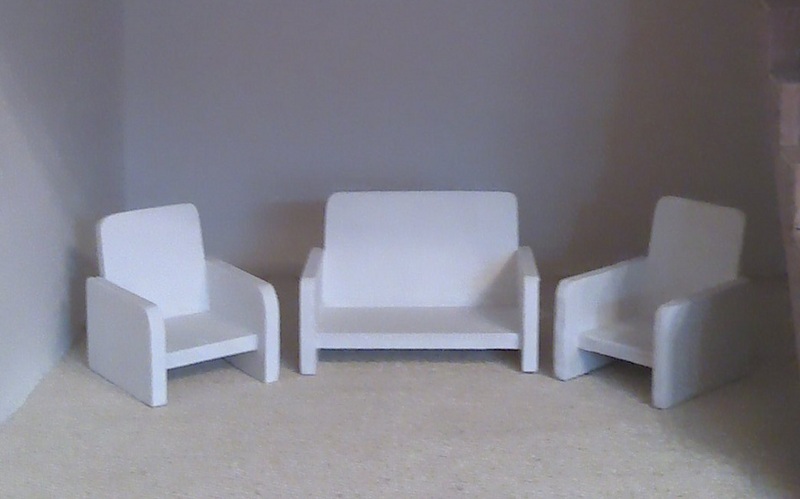 I was really chuffed with the furniture, we've still got a load of other furniture to make though. Lovely warm feeling reading this post, so very different to seeing the piles of ummmm..... tat (I'll use that 'ladylike' word, lol) that so many children get from shops. It's fabulous. I want to live in it! brilliant! I particulalry love the window trims: and the crochet cushions are just ADORABLE! Wow! Just Wow!!! Absolutely amazing work! Thanks for much for linking up!